Last year I started my annual review of portfolio returns by saying; “2015 was a lousy year for Canadian investors”. Well, 2016 was a turnaround year as the Canadian dollar strengthened modestly and Canadian equities rebounded strongly. A stay-at-home 60/40 investor who invested 60% of their funds in a Canadian stock ETF (XIU), 30% in a Canadian bond ETF (XBB), and 10% in a Canadian real return bond ETF (XRB) had a 2016 total return (including reinvested dividend and interest payments) of 13.9% in Canadian dollars, a dramatic improvement from the 3.1% loss generated by the same portfolio in 2015. The Canadian dollar strengthened 2.8% against the US dollar, so the all Canadian 60/40 Portfolio had a 2016 total return of 17.2% in US dollar terms, a substantial recovery from the 19% loss in USD terms in 2015. The focus of this blog is on generating good returns by taking reasonable risk in easily accessible global (including Canadian) ETFs. To assist in this endeavor, we track various portfolios made up of different combinations of Canadian and global ETFs. This allows us to monitor how the performance of the ETFs and the movement of foreign exchange rates affects the total returns and the volatility of portfolios. 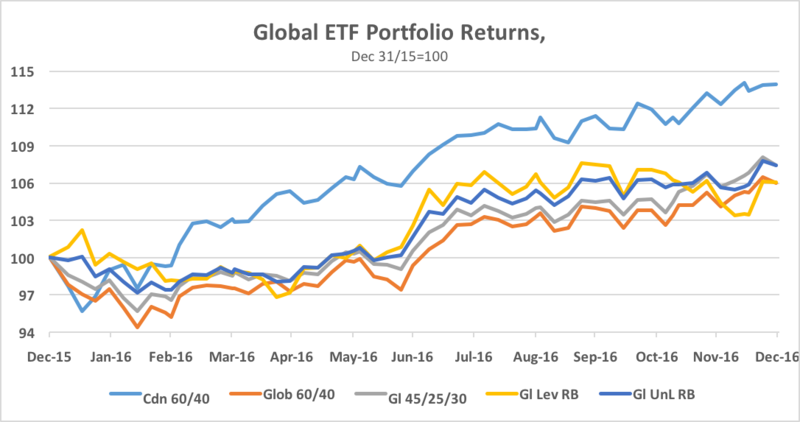 Since we began monitoring these portfolios at the end of 2011, we have found that the Global ETF portfolios have all vastly outperformed a simple stay-at-home portfolio. In 2016, we saw a reversal of this trend. In 2016, with the CAD appreciating almost 3% against USD and 8% against EUR, the best global ETF returns for Canadian investors were in Canadian equities and US small cap equities. The worst returns were in Eurozone bonds and equities and US Treasury bonds. The chart below shows 2016 returns, including reinvested dividends, in CAD terms, for the ETFs tracked in this blog. The returns are shown for the full year (green bars) and for the period following the election of Donald Trump as President in October (blue bars). Global ETF returns varied widely across the different asset classes in 2016. In CAD terms, 15 of 19 ETFs posted gains, while just 4 posted losses. The best gains were in the Canadian equity ETF (XIU) which returned a robust 21.2%. The US Small Cap Equity ETF (IWM) was second best, returning 18.2% in CAD terms, followed by the US High Yield Bond ETF (HYG), which returned 10.3% in CAD. Other decent gainers included the S&P500 ETF (SPY), the Emerging Market Equity ETF (EEM), the commodity ETF (GSG), and Emerging Market Bonds, both USD-denominated (EMB) and local currency denominated (EMLC). The worst performers were the Non-US Government Bond ETF (BWX), the Long-term (10-20yr) US Treasury Bond (TLH), Eurozone Equities (FEZ), and Japanese Equities (EWJ). 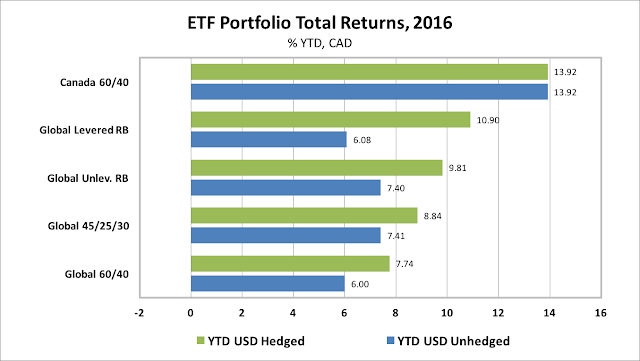 In 2016, the global ETF portfolios tracked in this blog posted decent returns in CAD terms when USD currency exposure was left unhedged and stronger returns when USD exposure was hedged. In a November 2014 post we explained why we prefer to leave USD currency exposure unhedged in our ETF portfolios. A simple Canada only 60% equity/40% Bond Portfolio returned 13.9%, as mentioned at the top of this post. Among the global ETF portfolios that we track, the Global 60% Equity/40% Bond ETF Portfolio (including both Canadian and global equity and bond ETFs) returned 6.0% in CAD terms when USD exposure was left unhedged, but 7.7% if the USD exposure was hedged. A less volatile portfolio for cautious investors, the Global 45/25/30, comprised of 45% global equities, 25% government and corporate bonds and 30% cash, gained 7.4% if unhedged, and 8.8% if USD hedged. Risk balanced portfolios performed similarly in 2016 if unhedged. A Global Levered Risk Balanced (RB) Portfolio, which uses leverage to balance the expected risk contribution from the Global Market ETFs, gained a 6.1% in CAD terms if USD-unhedged, but had a strong return of 10.9% if USD-hedged. An Unlevered Global Risk Balanced (RB) Portfolio, which has less exposure to government bonds, inflation-linked bonds and commodities but more exposure to corporate credit, returned 7.4% if USD-unhedged, but 9.8% if USD-hedged. In my view, there were four key policy events that left a mark on Canadian portfolio returns in 2016. The first was the Bank of Canada's decision not to cut the policy rate in January. The second was the US Fed's decision to delay its decision to hike the US policy rate until December. The third was the Brexit vote. The fourth was the unexpected election of Donald Trump. The impact of each of these four events can be seen in the chart below which tracks weekly portfolio returns over the course of 2016. The Bank of Canada's decision not to validate market expectations which leaned toward a January rate cut, provided a boost for the Canadian dollar but weakened returns on unhedged global portfolios. The Fed’s decision to delay hiking the US policy rate in response to weak first half real GDP growth kept the Canadian dollar on a strengthening path until mid-May, when the Fort McMurray forest fires caused a stumble in Canadian growth and a weakening of CAD. The Brexit vote on June 23 triggered a brief pullback in global equity markets and, combined with the introduction of negative policy rates in the Eurozone and Japan, saw global bond yields fall to their low for the year. This combination saw a period of outperformance by risk balanced portfolios with heavier allocations to fixed income. The US election (along with a strengthening in global economic data) triggered a US-led rally in equity markets. US equity ETFs, especially the Small Cap ETF (IWM), performed best after the election, along with the commodity ETF. The US dollar gained ground against all currencies, including the Canadian dollar. Bonds sold off sharply everywhere. 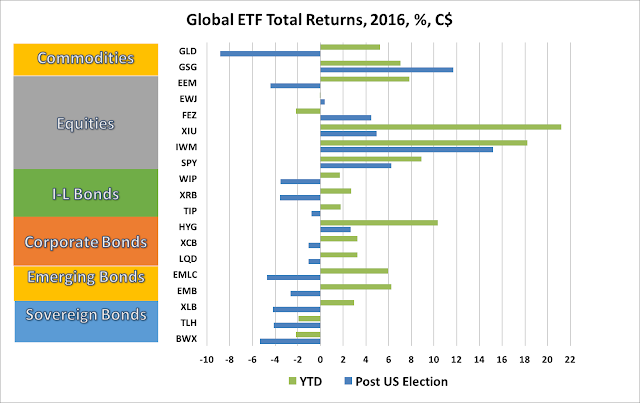 As a result, equity-heavy (and bond-light) portfolios performed best in the post-election period. As we enter 2017, the most interesting question, in my mind, is whether the all-Canada 60/40 ETF portfolio will continue to outperform the unhedged global ETF portfolios as it did in 2016. As the chart below shows, the 2016 outperformance was the first since we started tracking these portfolios at the end of 2011. Even taking 2016 into account, the Canada 60/40 portfolio has returned 6.3% per annum over the past five years, badly trailing the global portfolios, which have all returned between 9.6% and 10.2% per annum. 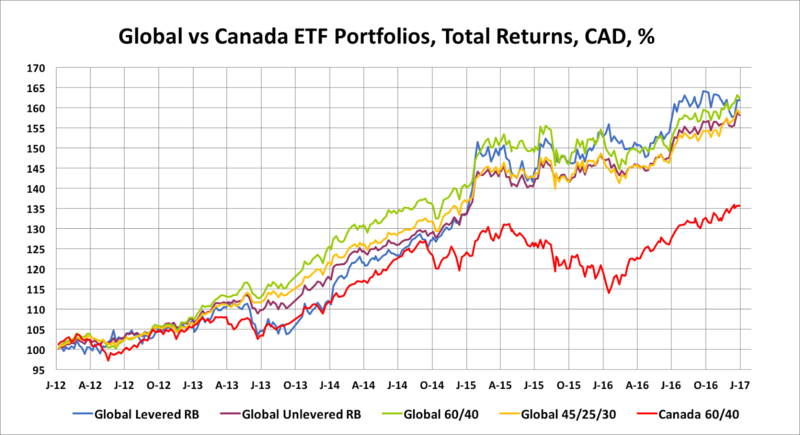 A C$100 investment in the Canada 60/40 ETF portfolio at the end of 2011 would have risen in value to C$137 by the end of 2016, compared with C$158-163 for the four global ETF portfolios we track. The answer to the question will be determined largely by the behaviour of commodity prices, the Bank of Canada and the Canadian dollar. Consensus expectations look for commodity prices to firm modestly, for the Bank of Canada to remain on hold even as the Fed hikes its policy rate by 75 basis points and for the Canadian dollar to weaken moderately against the USD. The consensus does not unambiguously favor either the all-Canada or the global portfolios. The best plan seems to be to wait, to watch and to react as economic and policy uncertainty gives way to more clarity.